Story - 1: Yellow Lantern's words are laughter when one considers that there is nothing secure in world of Injustice. Anyone can be beaten, anywhere can be infiltrated, by anyone at anytime and for no bloody good reason. 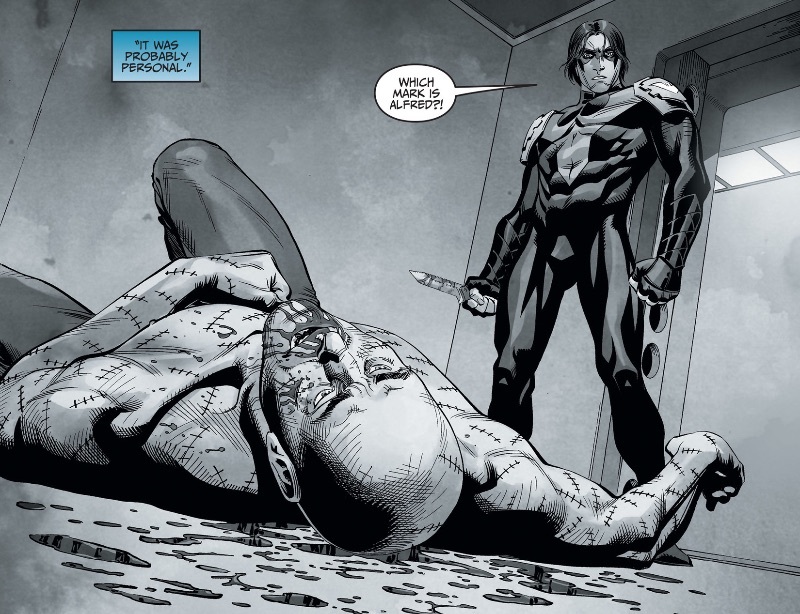 That Nightwing wants revenge isn't so out of sort. It's the manner in which it is presented to the reader. It's literally dropped out of nowhere, and what should have been a somewhat cathartic moment, instead becomes more B-roll, and that "B" stands for bog. Case in point of the aforesaid: Deathstroke has been unbeatable in this story. He survives bullets, gas, fire, heavy hits, he may as well be Kryptonian. 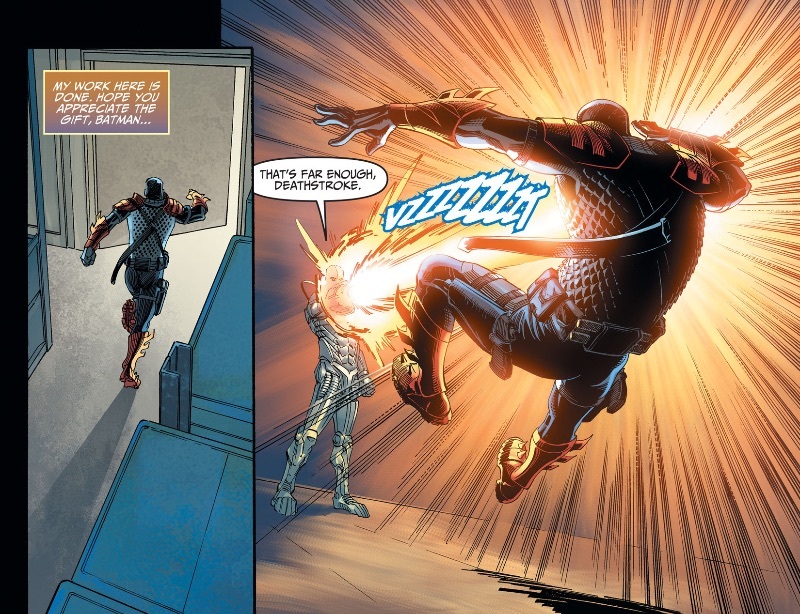 Cyborg arrives and blasts him with a nondescript weapon, and it's over. Would that Cyborg had used the same weapon when he was fighting against the Batman just a few issues earlier. It's a contemptuous way to deliver a story to a readership that is obviously into Injustice for the long-haul, and it's quizzical as to why. Time constraints, page count, editorial interference, one can only speculate at what may hinder Buccellato's inability to render a cohesive and satisfying story, when he has plenty to work with, in spite of the limitations of the series. Art - 2: Injustice's art chores are usually rendered adequately, however, it loses from its rating for the languid portrayal of what should be a pivotal scene. It never comes across that the scene is violent, vengeful, or otherwise. It's just there. Cover Art - 3: The colours are way off here. So much so that on first glance, I nearly thought Hawkman was back somehow.